Dare 2 Dream Leaders Inc. 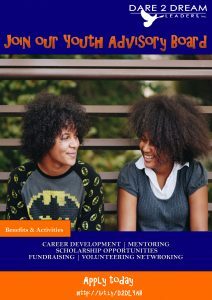 Youth Advisory Board is an extension of our youth program. The advisory board serves as a both career development and mentoring between the executive board members and the youth advisory board. Thus, providing the youth, particularly the middle school, with better opportunities. Members of the Youth Advisory Board will learn the structure of an advisory board. Participate in planning events and head fundraising campaigns. Attend monthly meetings and conference calls. Accept an executive role such as President, Vice President, Secretary and Treasurer. A passion to want to create change for youth in Brooklyn, New York. Alumni of Dare 2 Dream Leaders Inc. preferred, but not required. Available once per month for on site meetings and monthly conference calls. Outgoing individual with the ability to work productively with a team and as an individual. Has the ability to use social media platforms such as Facebook, Twitter, Instagram, Snap Chat, etc. Has access to a computer and phone. Knows how to office programs such as Microsoft Word and Excel.